Heavy sea ice off Newfoundland and southern Labrador has been an issue for months: it brought record-breaking numbers of polar bear visitors onshore in early March and April and since then has hampered the efforts of fisherman to get out to sea. Let’s look back in time at how the ice built up, from early January to today, using ice maps and charts I’ve downloaded from the Canadian Ice Service and news reports published over the last few months. The tour is illuminating because it shows the development of the thick ice over time and shows how strong winds from a May storm combined with an extensive iceberg field contributed to the current situation. Bottom line: I can only conclude that climate change researcher David Barber was grandstanding today when he told the media that global warming is to blame for Newfoundland’s record thick sea ice conditions this year. I suspect that because Barber’s expensive research expedition was scuttled, he simply had to find a way to garner media attention for his project — and the media obliged. Read to the end and decide for yourself. Posted on June 28, 2013 | Comments Off on Why is it that every decade, Eastern Beaufort sea ice gets really thick? 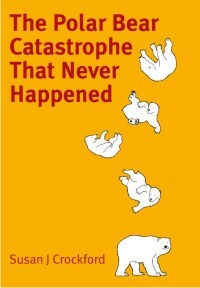 I’ve written before about the incidents of starving polar bears in the eastern portion of the Southern Beaufort Sea (here, here, and here). For two or three years every decade since the 1960s, shorefast ice in the Eastern Beaufort (Fig. 1) has become too thick and compressed in the spring for ringed seals to maintain their breathing holes, so most or all of them presumably go elsewhere — as seals did in Greenland when ice got too thick there (Vibe 1965). With few or no seal pups born during March and April in thick ice years, some bears had a hard time finding enough food: starving bears and dying cubs were the result. Figure 1. ‘Eastern Beaufort’ (yellow square) polar bear study region. 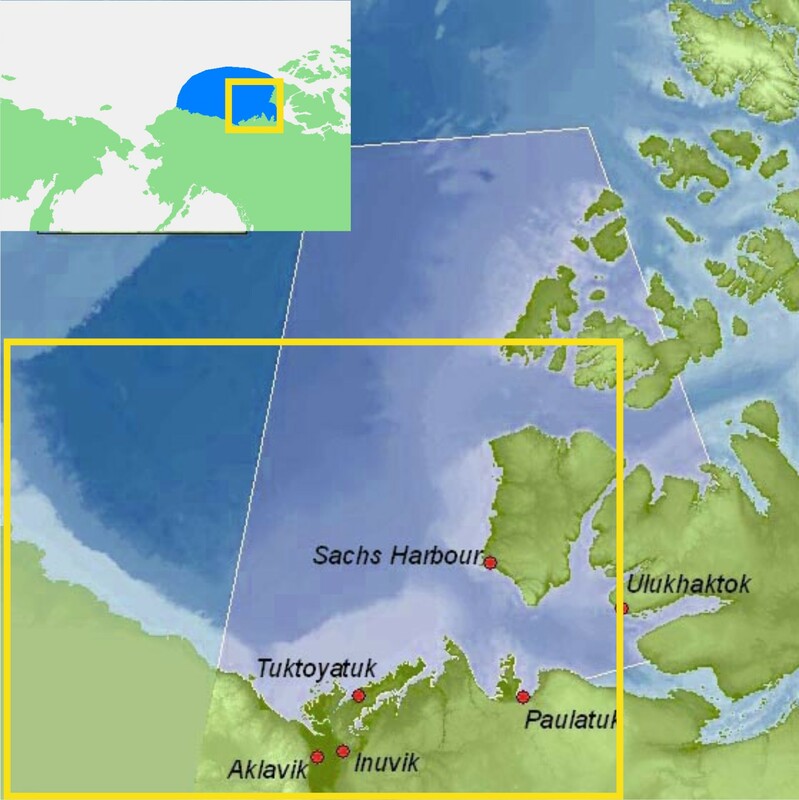 The communities of Tuktoyatuk (locally known as ‘Tuk’), and Sachs Harbour on southern Banks Island have been used as base camps for polar bear research because they are accessible by plane via the larger community of Inuvik. The light blue portions along western Banks Island and the Eastern Beaufort/Yukon mainland coast indicate shallow continental shelf areas (20 km wide in places) where extensive shorefast ice develops every winter. Main map from Beaufort Sea Partnership, inset map from Wikipedia. I’ve been trying to get my head around why this would happen in the Eastern Beaufort. Once or twice – maybe – but several times every decade? What on earth drives such a process? So, I did some reading (actually, quite a lot of reading) and have what appears to be at least a partial answer. All indications are that the occasional development of exceptionally thick spring ice in the Eastern Beaufort is the result of an entirely natural, cyclical phenomenon. However, some polar bear biologists are attempting to blame the latest episode (but not earlier ones) on increased amounts of open water in the Chukchi Sea during fall of the early 2000s. That doesn’t seem a plausible explanation to me, given the history of the sea ice in this region. Have a look. Figure 2. Beaufort sea pressure ridges, spring 1949. Courtesy Wikipedia (from NOAA’s “At the ends of the Earth” image collection #corp1014). Comments Off on Why is it that every decade, Eastern Beaufort sea ice gets really thick? 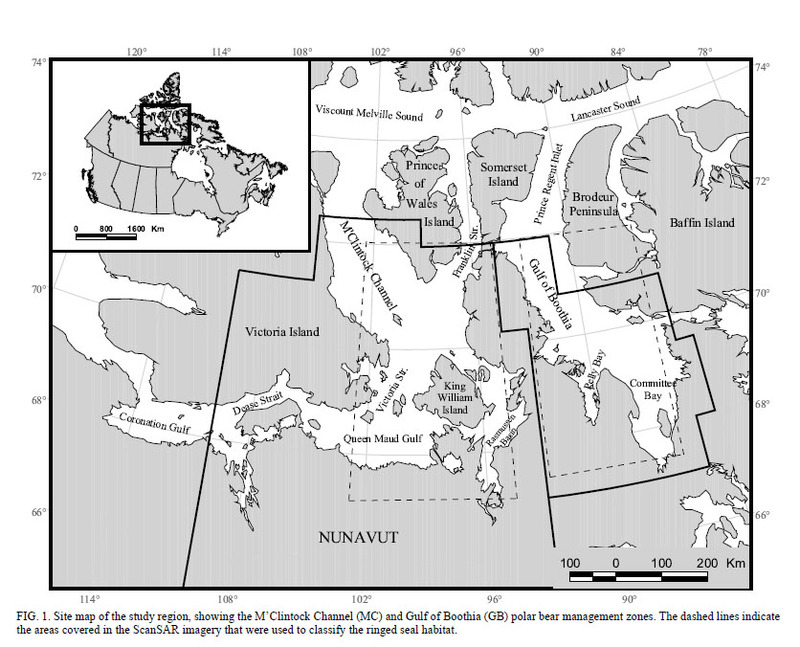 The issue of polar bear population density (# of bears per 1000 km2) came up a few posts ago, during my discussion of the new Davis Strait population study by Lily Peacock and colleagues (here). Since the various polar bear subpopulations across the Arctic are so different in size, calculating the density of bears in the various regions generates an interesting metric of how well the regional populations are doing relative to each other. Almost 20 years ago, Taylor and Lee (1995) did just that: they determined the density of polar bears in the various Canadian subpopulations, as of the 1990s. Surprisingly, the ‘leader’ among those, by a wide margin, was one of the smallest in geographic area: the Gulf of Boothia. Located in the central Canadian Arctic (see Figs. 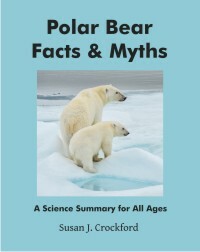 1 and 2 below), in the 1990s, tiny Gulf of Boothia supported a density of 10.4 polar bears per 1000 km2, the highest density of all regions examined. Figure 1. The Gulf of Boothia (circled) is right in the middle of the Canadian Arctic. In terms of geographic area, it is one of the smallest of all 19 subpopulations worldwide: at only 170,000 km2, only the Norwegian Bay and Kane Basin subpopulation regions, also in Canada (just to the north of Gulf of Boothia), are smaller at 150,000 and 155,000 km2 respectively (Vongraven and Peacock 2011). 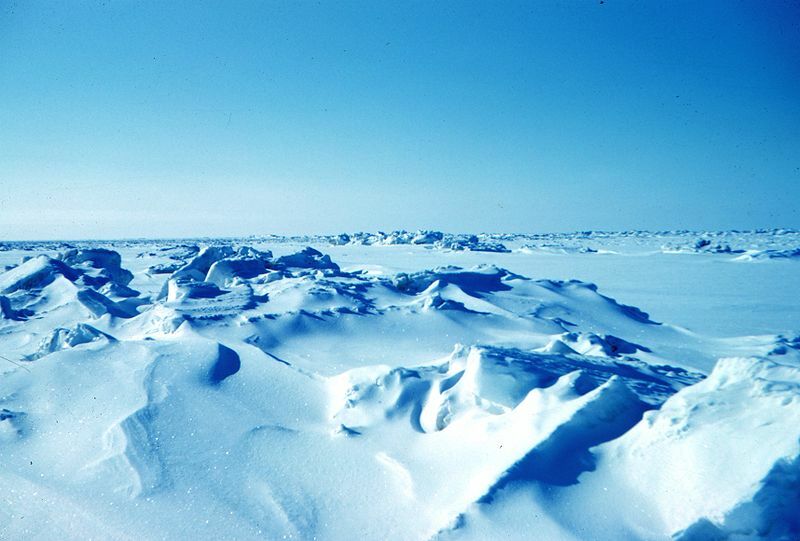 The Gulf of Boothia supports the highest density of polar bears known. 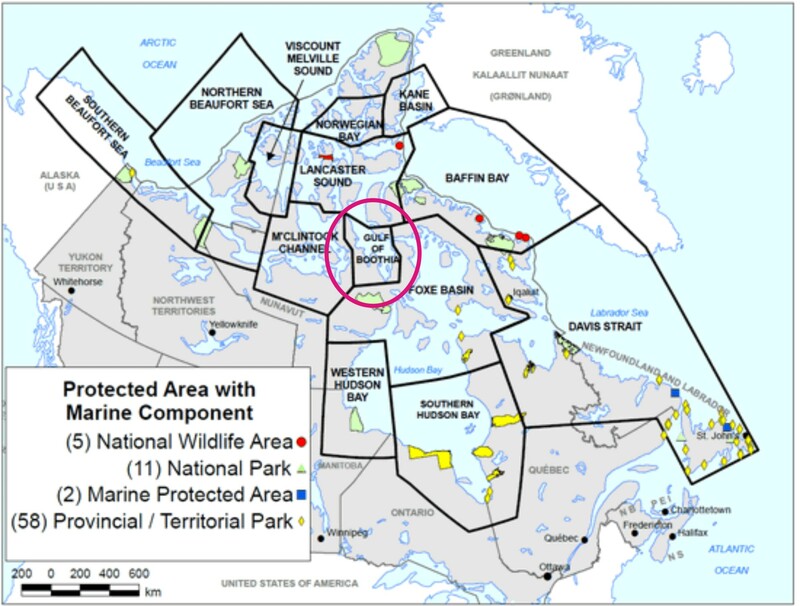 Modified from the map of polar bear protected areas provided by Environment Canada. But this density value for Gulf of Boothia was based on the 1986 population estimate of 900 bears – what is the most current figure? For that, we need an updated population assessment. That was done in 2000 and it generated an estimate of 1,592 ± 361 bears (Taylor et al. 2009). 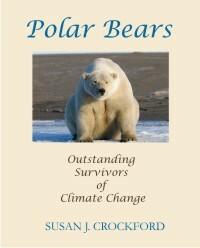 In other words, despite there being no trend in either sea ice conditions or habitat for seals – and a yearly harvest of 40 bears – polar bear numbers in the Gulf of Boothia increased significantly (by almost 700 bears) during the twenty years between 1980 and 2000. Even if the 1986 estimate of approximately 900 bears was somewhat less accurate than the more recent one, the fact that tiny Gulf of Boothia can support 1,592 bears is surely a remarkable feat. Using this new population estimate and the same area of ‘available habitat’ used by Taylor and Lee in 1995, I calculated the most recent density at a spectacular 18.3 bears per 1000 km2! [note this is exactly what Peacock et al (2013) did to get their density value of 5.1 bears/1000 km2, discussed here.] But I didn’t update just Gulf of Boothia, I did them all. The updated density values for Gulf of Boothia and several other Canadian subpopulations are listed in Table 1 below. Note that aside from Davis Strait, as far as I know these density figures have not been published elsewhere: you’re seeing them here for the first time.